Thekchen Chöling, Dharamsala, HP, India – To make an auspicious start to the second day of teachings for Tibetan youth, His Holiness the Dalai Lama requested the visiting group of about 60 Thai monks to recite the Mangala Sutta. Students from classes 7, 8 and 9 at Upper TCV gave an energetic debate presentation discussing vowels and consonants. They were followed by a group of TCV staff who debated questions of science to which His Holiness listened intently. Addressing the audience of 8200 people, including 2800 primarily Tibetan students and 1500 foreigners from 71 countries, His Holiness spoke of the Nalanda tradition, its inner values and the stress it puts on employing logic and reason as assets to be put to the service of all humanity. “This is something worth trying,” he said. “We may feel at peace here, but elsewhere murderous violence has broken out. There have been the recent savage attacks in Britain and in other places millions are on the verge of starvation. In all of these crises human beings are involved. We need to remind ourselves that basic human nature is compassionate. We are open, friendly and cheerful as children, why do we become aggressive and violent when we grow up? 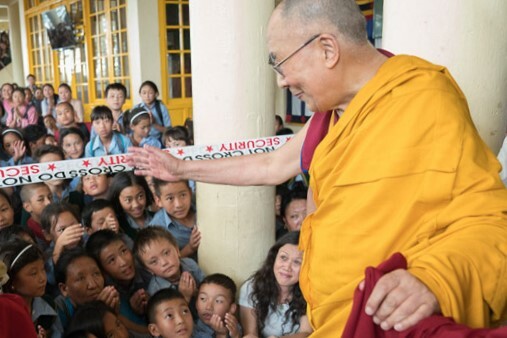 His Holiness also mentioned that an American who had been involved in the project to resettle 1000 Tibetans in the US told him that he had done so because he felt Tibetans would make a positive contribution to society. 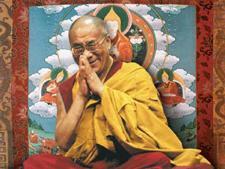 He warned, however, that Tibetans could lose their good reputation if they’re not careful. He then read through the verses of the praise clarifying the qualities of the masters of the lineages of the profound and vast teachings. Among several questions from Tibetan students, a young woman observed that it sometimes happens that you dream of a place you have not been to before and later recognise it when you go there. She wanted to know what is going on. His Holiness explained that people’s different dream experiences can be connected to their particular physical disposition. “There are people who have clear dreams in which they see the future. I have friends who dreamt of being here in Dharamsala while they were still in Tibet and recognised it when they got here. It seems the subtler mind has the power to see the future. “When I’m awake I don’t remember anything about past lives, but in my dreams I do. I have one memory of being a prisoner in ancient Egypt and being brought before the king in chains. He sat high on his throne and looked down at me commanding that I be released. I also have dreams of being with Indian and Tibetan masters of the past. His Holiness asked if there was anyone among the students who was able to recognise that they were dreaming when they were in the dream state. He mentioned that there are ways to prompt yourself to do this and that it is a powerful opportunity to do spiritual practice. The teachings for Tibetan youth will continue tomorrow morning during which His Holiness has promised to conduct a ceremony for generating the awakening mind of bodhichitta.